Exhibition Dates: March 7–25, 2018. 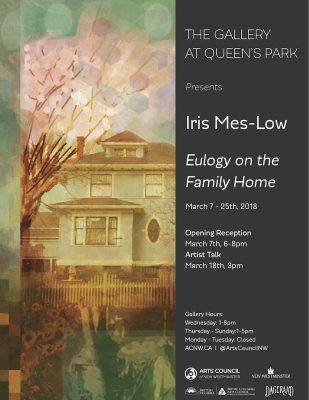 The Gallery at Queen’s Park is pleased to present Iris Mes-Low’s solo exhibition Eulogy on the Family Home. Iris Mes-Low’s series of paintings and computer manipulated giclées are based on houses in New Westminster. Addressing the affordability crisis in Metro Vancouver, Mes-Low explores the idea of what is a possibility for some is a pipe dream for many and a reality for few. Mes-Low’s subjects are represented in a whimsical manner that express the uniqueness of the houses in the area, and are placed in reverse and in a fantasy setting. Iris Mes-Low is a New Westminster Artist born in The Netherlands with work in public and private collections in both Europe and North America. She works full-time in her studio at Braid St Studios in New Westminster. She has been painting and exhibiting her work for over 30 years.